This morning my husband and I were talking in the car. We were just chatting about nothing in particular (okay, I can’t remember what we were talking about in the beginning, but I think it was podcasts because homie loves talking podcasts). I don’t know how we segued into it, but I asked him if he had heard about the “Gorilla Mom”. At least that’s what she’s been called in some of the things I have read. Well, it’s actually the least awful thing she’s been called so far. For anyone that doesn’t know, the Gorilla Mom is the woman whose son climbed into an open gorilla enclosure this weekend. The horror was caught on video by a cell phone. To be honest, I have not watched the video. I can’t bring myself to do it for a number of reasons. As a mother, I just can’t bear to hear her calling out to her son that she loves him as the gorilla drags him through the water to his possible death. I can get enough of an idea of that from the stills. As an animal lover, I know how this ends, with the very unfortunate death of the gorilla in question. But if this is your kind of thing, Google it. If you’re like me and you’re going to skip the grainy footage I will sum it up for you. There was an open gorilla enclosure at the zoo. A four year old boy was able to enter it. The most predictable thing in the world happened, and the gorilla got ahold of the boy. The zoo’s staff made the decision to shoot the gorilla to save the boy. The boy was taken (seriously injured, but alive) to the nearest hospital. Mom follows in an absolute panic. The end. Only that’s not the end, because this is 2016, there is cell phone video footage, and a little thing called the internet. So there my unsuspecting husband sits, telling me about the latest podcast he has stumbled upon, when I bring it up. I ask him if he has heard about the child that fell into the gorilla cage. He has, because again, the internet. I ask him if his Facebook is flooded with angry villagers brandishing their online pitchforks. His is not. I find this both surprising and unsurprising. Surprising because I can’t go ten minutes without a comment popping up about it. Unsurprising because of what makes up my news feed (mostly moms, blogs, and mom blogs, you get the picture). I have read some seriously horrible things ranging from how the zookeepers should have shot the mother instead of the gorilla, to they should have done nothing and if the gorilla killed the kid, well then that’s a lesson learned for the child’s mother, with a whole lot of other terrible things in-between. Oh, and death threats. I almost forgot that the mother is being subjected to death threats. Because, that’s a normal way for a human being to behave. 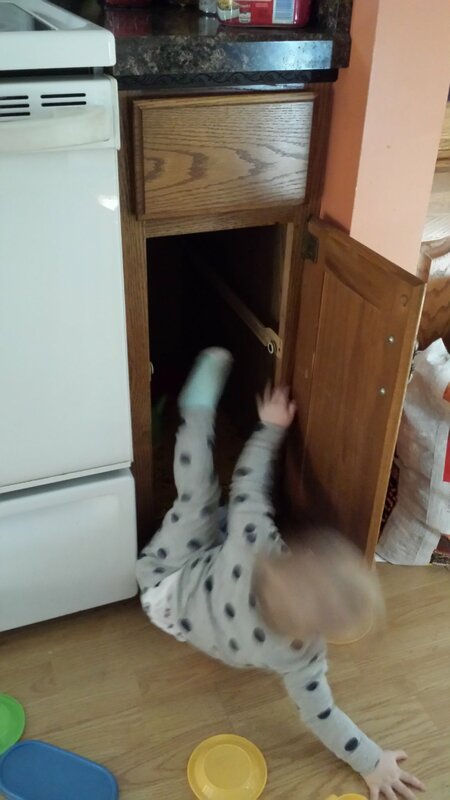 Trying to take a cute picture of my daughter in the cabinet. Instead caught the moment she lost all trust in me. I’m aggravated beyond belief. Even talking about it this morning with my husband (who was not disagreeing with me about anything), I felt my blood pressure start to rise and my voice begin to go up an octave, which is usually the precursor to me going full on shrill. First, everyone chill the F out. Yes, it is unbelievable that a mother lost sight of her child long enough for him to get into a gorilla enclosure. Do you know what she was doing when this happened? Taking care of one of her THREE OTHER CHILDREN. She didn’t leave them all waiting in front of a bar while she popped in for a shot and a beer. She was parenting. Also, kids are fast. Just yesterday I was standing in my backyard with my in-laws while we were moving my daughter’s slide around. I looked away from her long enough to point to a spot in the yard and say, “I think it should go there” and when I turned back around my daughter was gone. She had made it around the corner to the car port in that short of an amount of time. If I had given any more directions she would have been half way to Mexico. And that’s just with one child. Now imagine there were four of them. It happens. It happens in a split second and that’s all it takes. As a matter of fact, that’s all it ever takes for something to happen, a split second. I wish everyone would remember that for a moment. She’s just a mother, she’s just human. And she never thought it would happen to her either. Secondly, in all of the news stories and attacks I have read I had yet to hear the father mentioned. A quick google search later and I discovered that he may or may not have been there (nobody seems as concerned about his whereabouts). I did discover however that he, like everyone else alive, has a past. Unfortunately his includes some trouble with the law. How that is relevant to the zoo incident remains unclear to me since none of it has to do with a.) How he parents, b.) Animals in captivity, or c.) Present day. Thirdly, it is unbelievably sad that an innocent wild animal had to be put down. Especially one that is only guilty of being a wild animal. The only silver lining may be the attention that has been brought to a very serious problem in the world, which is the exploitation and extinction of so many species of animals. Let’s channel all of our anger, indignation, and new found eco-consciousness towards addressing that problem. Here are a couple of companies that could use your support. In the meantime let’s all try and remember that moms are human too. We all make mistakes. Sometimes they are small ones, sometimes they are big ones, and sometimes your very worst moment as a parent gets caught on film and anyone with access to the internet gets an opportunity to weigh in on what you did wrong. Let’s not lose sight of the big picture in our hurry to drag out and mount our own soap boxes. A mistake almost turned fatal for a child but fortunately it did not, unfortunately an innocent animal was not so lucky. This mother (AND FATHER) will have to live with both of those things for the rest of their lives. Okay, now who wants to help me get this thing back in the closet?